Its that time of year again… when we have to get our Pool Covers out, and winterize our swimming pool! 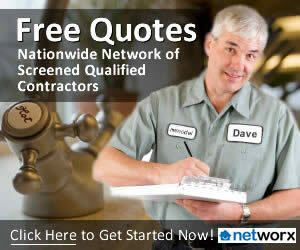 Depending on where you live and the type of pool you have, this can be a 30 minute process, or a full day! Typically, it takes longer to cover an above ground pool, than an inground… but overall, the process is very similar to a point! The first thing you must consider when covering your pool, is the outside temp! If you cover it in the middle of a warm spell, you have done nothing more than invited algae to grow in this closed in environment! By waiting until the outdoor temperature is steadily below the mid-60’s, you should have no problems. Besides… we’re going to shock it with some chemicals anyhow! Just like a normal cleaning, make sure your pool is perfectly clean before putting a cover on it! If you cover a dirty pool, you can rest assured there will be stains on the walls or liner when you open it up in the spring. After you clean it, make sure you allow the vacuum and accessories to dry completely before you store them. We all know water expands when it freezes right? If you have an above ground pool, draining 6-12 inches of water is a MUST! In most cases, you want to go just below your skimmer level. If you don’t take this step, you may find that the added pressures on the walls and rails will damage them. Little Giant makes great Pool cover pumps that work perfectly for this! Remember that bit about water freezing again… If you fail to take this step, you might just find some cracked and useless components when springtime arrives! If you had your pool for any period of time, you are aware of the backflushing procedures, and can easily drain off the filter and lines with this method. In rare cases, you may even want to use a small air compressor and blow the lines out completely, but as long as you have most of the water out of the system, there will be no expansion issues. Now that your pool is partially drained, your water lines clear and thepool cleaned, add your winter chemicals to your floater… and get ready to cover! Put on the Pool Cover! If you have an inground pool, chances are good that you already have a cover on wheels, you can roll out and fasten to your tie-downs, but if you have an above ground pool, you must put a bubble in first! These pool air pillows will not only keep your cover from freezing into the water, but they will help to allow rain and debris float off the surface, and preserve the life of the cover. Tie ropes to the corners of your air pillow, and when you have it positioned in the center of the pool, fasten the ropes to the your tie downs, to keep it centered over the winter ahead. After you have the pool air pillow in place, its time to get a bit of help and pull the cover over your pool! 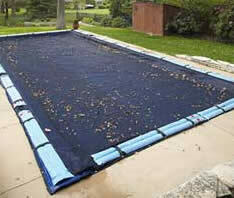 Start by laying your cover on the ground next to your pool, with the top facing down! Go to the farthest end, away from your pool, and tie some long ropes to the edges, usually 2-4 are needed. After you have them tied securely, get your helper and start walking, one on each side of the pool, draping the cover over it as you go. Since you laid the top down, you are not getting debris on the side that will touch the water! After you have the cover centered, fasten your tie-downs on opposite sides equally, to assure it stays centered through the winter! last year the weight of snow on our above ground pool cover pulled the pool walls in. the cover was touching the top water level so when we tried to pump the water off the cover it just kept sucking more pool water out but not removing water from top of cover. how do we keep cover on tight with out putting so much stress on walls? Thanks for the comment and questions. Keeping the cover in place is a common question in regard to above ground pools. If you dont currently use a pool bubble, or pillow, under the cover, that would be the first thing to add this season. If you do use a pillow and the snow continues to pull it in, the main thing you need to do is work on keeping the cover secured over the sidewalls. There are cable systems that loop through all of the eyelets in the cover, and more or less act like a belt on your waist. You loop the wire through each eyelet and where the ends meet, there is a ratchet system that tightens the cable snug, and keeps it from allowing the edges to go into the pool. One other method I used to use when I lived in the North (Massachusette), was to use 10 inch tent stakes, driven into the ground, approximately 2-3 feet away from the base of the pool walls, in intervals of every 3-4th eyelet. Instead of using bungie cords, use clothesline or some other strong rope, and fasten the cover to those stakes. It immediately reduces the load on the pool walls and transfers it to the ground, using the top rail as leverage.